We apologize for not blogging on Monday and Wednesday. Jack is leading his annual tour through Scotland and Ireland, and this is the first time Wendy has gone with him. We’ve had our hands full with the fun and logistics, and are now homeward bound. We invite everyone to hop over to Wendy’s Facebook page, which is public, and view the videos of the trip. It was lovely, if we do say so ourselves. And Wendy will be back on schedule with the Monday book, plus a few observations about life and love and living well. I was born in Dunfermline, Scotland on February 5th 1942 (which explains why I can properly pronounce ‘February’) and that was at a time when the outcome of WW2 was hanging in the balance. Since then I’ve lived through the cold war, including the Korean War and the Vietnam War, the demise of the British Empire, The Suez crisis, the Falklands war, the first Iraq war, the second Iraq war, the invasion of Afghanistan and a host of other inglorious adventures. I’ve also traveled the world and here’s a funny thing – the people I’ve met along the way have been a lot like myself. I’ve met very few folk I’d describe as seeming bad or dangerous and on the odd occasion I have, it usually only required a conversation to find common ground. What have I learned along the way? Well – not to accept unquestioningly what I see in newspapers and on TV; and also not to accept unquestioningly what I read on social media either. Most people are basically decent and want the same things in life for themselves and others. Of course that doesn’t mean we can’t be manipulated and influenced. If I have to state one over-riding belief it would be that within us all there’s a dark side, but there’s also an awareness of ‘The Light’. It can be found in all religions and belief systems and I really think that we all have a desire to strive towards the light. Am I optimistic for the future? I’ve been extraordinarily lucky throughout my life so I tend towards the ‘glass half full’ point of view; in addition I naturally see the world from a Western position, which makes me privileged. But allowing for all that I do still think that, ever so tentatively, we are moving in the right direction. We have hiccups, of course (and never more than right now), but the light still beckons us on. Last night Wendy and I were the guests of an informal book group in Abingdon VA.
As we followed one of the members along the winding road to the house where they were meeting we passed more and more exceedingly imposing residencies and speculated on what might be awaiting us. However any fears we had were quickly allayed as the rest of the members trickled in. We had forgotten that the group had visited the bookstore earlier in the year, had all bought copies of ‘The Little Bookstore’ and were very well versed in our adventures. They all came in clutching their copies of the book – each copy with post-it notes sticking out from favorite pages and passages. We were among old friends! We have often remarked upon how completely different these occasions tend to be. Of course there are book clubs, reading groups, friends of the library groups and writing clubs and they are each bound to have a different focus. We certainly never know exactly what to expect, which is why we tend to be a bit nervous of them. what’s interesting is that I see similarities to my singing career over the years – gigs were often like that too. Whenever we attend an event we start off by trying to judge what folk want to hear. Will it be writing advice, getting an agent advice, finding a publisher advice, more about Big Stone Gap? But this was close to being unique – a whole group who had already read the book and visited us in the bookstore. We proceeded to have a really great evening of personal stories, reminiscences, parallel experiences and our own continuing adventures beyond ‘the book’. Unusually, we were even able to open up a bit on some less happy things that were hinted at in ‘The Little Bookstore’ or followed on from its publication. That’s something we would definitely only do in the company of old friends! 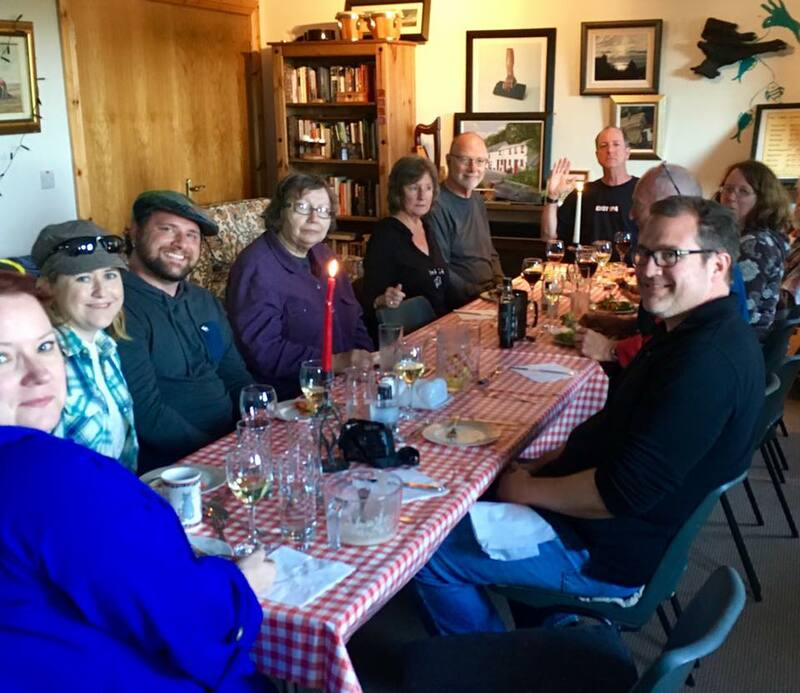 To finish, I should say that the evening started with me as the only man in the room, but we were eventually joined by our host’s husband and his name is Moffat – and that’s also the name of a town in Scotland that I visit every two years on my group tour. Oh – and we ended with some songs! This is not going to be a rant, believe me – I’m a Quaker and we don’t do that! As we approach ‘The Season’ I’m seeing lots of messages on Twitter and Facebook suggesting that there is some kind of ban on wishing people Merry Christmas. I have no idea where it originates and have never seen any evidence that it exists anywhere. But it worries me that some people believe that – not only that, but that they should believe it’s necessary to repeat and promote it! Wendy and I have friends from many branches of Christianity – Quaker, Presbyterian, Episcopalian, Methodist and Baptist. We also have Jewish, Muslim and Buddhist friends. All of these friends wish us whatever seems appropriate at this time and we both accept their good wishes and reciprocate as we see fit. As a Quaker I believe that everyone (yes- everyone) has ‘a piece of God within them’ – we call it ‘The Light’. Personally I think we have both light and dark within us. Regardless of your particular belief I also believe that you look to whatever example or Prophet or Savior can lead you towards that light. I will soon be seventy five years old and I’ve experienced far too much of this stuff – enough, already! I believe we are entering a dark time in this world and we will be severely tested over the next few years – here in the US, but certainly in Europe and elsewhere as well. So I continue to struggle towards that elusive light and I wish all my friends and Friends the condiments of the seasoning (as I believe John Lennon once said). Did I say this wouldn’t be a rant? PS – Our annual Celtic Christmas event will be here at the bookstore on Saturday Dec 17th starting at 6.30. Please phone or email ahead to book your place as it always fills up fast! $15 charge for food an entertainment. My last guest post was about the satisfaction of completing work that I’d spent five years learning as an apprentice painter and decorator. The last time we had heavy rain here, which is almost two months ago, we noticed we had a couple of roof leaks. They were in complicated corners of our main roof which had been completely re-shingled about five years ago. This is not my specialty at all, and I no longer have the head for heights that I used to, so it was time to call in the expert. I have the good fortune to be friends with the owner of the biggest construction company around here and he had previously put me in touch with his preferred roofing guy. He came promptly, explained that he was in the middle of a big contract but checked the problem areas and promised to take care of them as soon as possible. Lo and behold, he arrived yesterday, carried out work with no fuss and today it has rained heavily all day with no signs of leaks. The rain is welcome, of course, as it was needed to douse the wild fires over in Tennessee. This past weekend we spent with Wendy’s parents in Knoxville, where her brother in law Dennis was working most of the time trying to diagnose and fix a long-standing problem with the heat pump (he knows about this stuff). When we got back here on Monday evening we discovered that our heat pump was acting up. I phoned the local company who had installed it three years ago and their engineer came this morning, established the problem and had it working again within an hour. In both cases the communication ahead of the work was first class, which is something else that I consider a very good sign. I was taught, during my training, as much about customer care as I was about the techniques of applying paint, hanging wallpaper or working safely at heights. What’s the ‘take-away’ from this? Know your limitations, trust professionals and don’t grudge paying them their worth, take advice where you can on the reputation of these professionals and treat them with respect. They will have earned your respect and loyalty. Here’s to my fellow professionals whoever and wherever they are! We had three hundred kids plus their supervising adults through the bookstore last Saturday. They were ‘trick or treating’ as these Americans say. They filed in over three hours, snaking through the place to the kids’ room to choose a free book, getting handed a cafe cookie and having a photo taken of them in costume before leaving for the next port of call. I wondered about that American tradition so I did some investigating – it turns out that it means “give me a treat or I will play a trick on you”. So, in other words, what would be described in an English or Scottish court as ‘demanding with menaces’! There’s been a fair bit of discussion on facebook over the last few days about the different Halloween traditions on the opposing sides of the Atlantic, and even about the various names for the vegetable that gets carved into a lantern for the occasion. I was forced to take part, if only to promote the correct name for the said vegetable. In Scotland the festival was, for me, always ‘Guising’ (dressing in disguise) and the lantern was carved from a tumshie (a large turnip) and the kids had to perform a poem, song or joke in return for their gift. It was always a family event too, with games – dookin for aipples or trying to snare a treacly scone dangling from a string by mouth with your hands behind your back. The name of the vegetable? I’ve heard Turnip, Swede, Neep and Tumshie (rutabaga over here) . It was always a tumshie in my youth. But when I grew up and became a responsible adult I was once asked to join an EU funded international environmental education project led by a Danish organization that had a license to grow hemp (don’t ask!). They suggested various Acronyms for the shared undertaking and one of them was NEEPS! I immediately agreed – of such is inter-cultural understanding achieved, although no-one understood why we’d agreed so quickly and enthusiastically. Long may these weird things continue to confound us, and I can still remember the smell of a candle burning inside a hollowed out tumshie or neep! For some reason that I can’t fathom we’re getting a lot of out of town (and out of State) visitors to the bookstore and the cafe just now. It’s not the season for school reunions or vacations, and although some folk have deliberately detoured this way because of reading ‘The Little Bookstore’ many of them haven’t. It seems to be a completely random thing – just passing through or maybe here for a funeral or family visit. Quite apart from the welcome business, it adds to the busyness! I love it when strangers come in when we have local loyal friends of the place just hanging out and everyone ends up swapping stories. 1) A couple drove for five hours from Elkins in WV yesterday because they had read the book. They visited yesterday afternoon then came back this morning as soon as we opened and stayed on for lunch. As they were leaving they said they’d be back soon. Of course they had dinner in town last night then stayed overnight in a local hotel and had breakfast before heading back here and encountering the hanging out crowd. 2) A gentleman drove up from Johnson City simply because he heard a repeat broadcast on the local NPR station of an interview with Wendy about the store. As soon as he heard my voice he said “you’re the guy on WETSfm that has the Celtic show”. I’ve been presenting Celtic Clanjamphry every week for almost ten years as an unpaid volunteer and, in return they now count that as sponsorship by Tales of the Lonesome Pine, so we get a mention on air as well. Just two examples of how new customers arrive at the door. Of course they are, for different reasons, already pretty well primed to be ‘on side’. The challenge for anyone who runs this kind of shop is to try to read the personality of the completely ‘cold callers’ and respond appropriately. As I said at the beginning we had a good few of them as well. One couple were quiet and focused and I simply responded to their occasional request while another guy started like that, then encountered a kitten and became much more engaged. On the one hand you have to like people to do this job, but on the other hand you have to be able to quickly read people too.